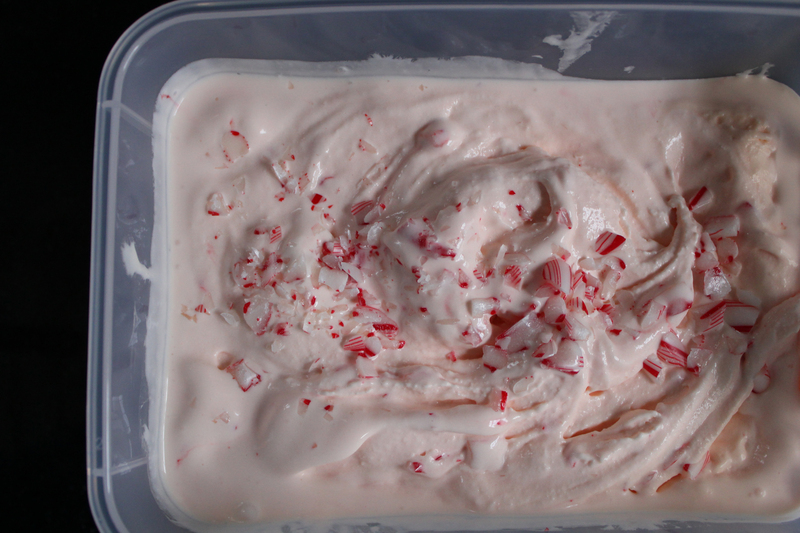 Of all the sweet treats to come out of my kitchen this past holiday season, this peppermint ice cream was my absolute favorite. Perhaps it is because ice cream is always my choice over cookies and cake, but maybe it was because this French-custard style ice cream was the creamiest, richest ice cream I have had in a long time. I was thrilled to finally use the ice cream maker I received as a gift almost seven months ago and delightfully surprised by how little trouble it was to make the custard. Of course, reading David Lebovitz’s The Perfect Scoop and following Elise’s great step-by-step instructions made the process that much easier. 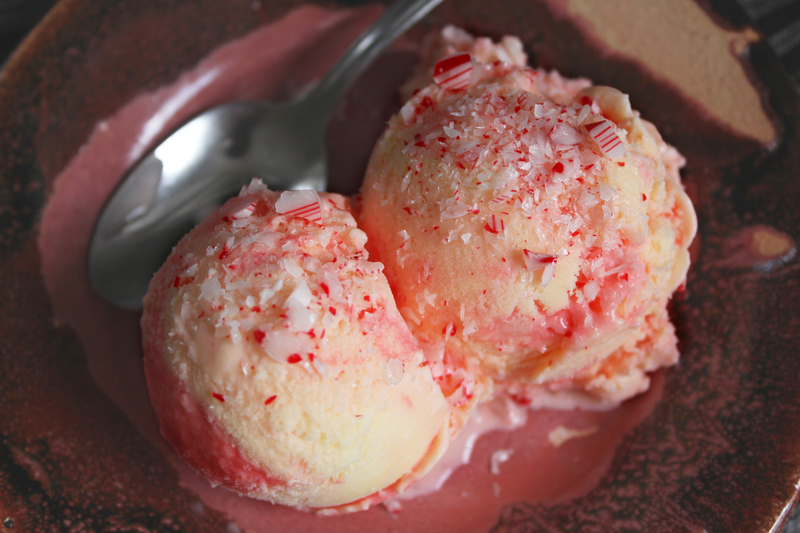 This ice cream is delicious with a generous topping of hot fudge sauce and additional sprinkling of crushed candy canes. And if you’re lucky enough to have a tiny bit left over for yourself after your family members go back for seconds (and thirds), then it’s perfectly enjoyable by itself, right out of the container you froze it in. The active time required in making the ice cream is only about 35-40 minutes total. It takes about 15 minutes to make the custard and then 20-25 to churn it in an ice-cream maker. Do be aware that most ice cream makers require the base to be frozen for at least 24 hours before you begin, and that chilling the custard can take anywhere from a few hours to overnight. So, even though it’s not much work, do plan ahead. And speaking of planning ahead, this is the perfect do ahead dessert. 1. Warm the milk, sugar, and salt in a medium saucepan. Make sure the sugar and salt completely dissolve. 2. Pour the cream into a metal bowl set in a larger bowl of ice and set a medium-mesh sieve on top. 3. In a separate bowl, whisk together the egg yolks. Slowly pour the warm milk into the egg yolks, whisking constantly, then scrape the warmed egg yolks back into the saucepan. 4. Stir the mixture constantly over medium heat with a wooden or heatproof rubber spatula, scraping the bottom as you stir, until the mixture thickens and coats the spatula, about 5-7 minutes. 5. Pour the custard through the strainer and stir it into the cream. Then stir until cool over the ice bath. Chill mixture thoroughly in the refrigerator. 6. One the mixture is thoroughly chilled, add peppermint extract, a 1/4 teaspoon at a time, tasting the mixture after each addition, until you reach the desired level of peppermintiness. I ended up using 2 teaspoons of Kroger brand peppermint extract, you may want more or less depending on your tastes and the level of flavor your extract has. 7. Once chilled, freeze in your ice cream maker according to the manufacturer’s instructions. I covered the mixture with plastic wrap and chilled in the refrigerator overnight. 8. Once the ice cream has been formed in the ice cream maker, it will be fairly soft. 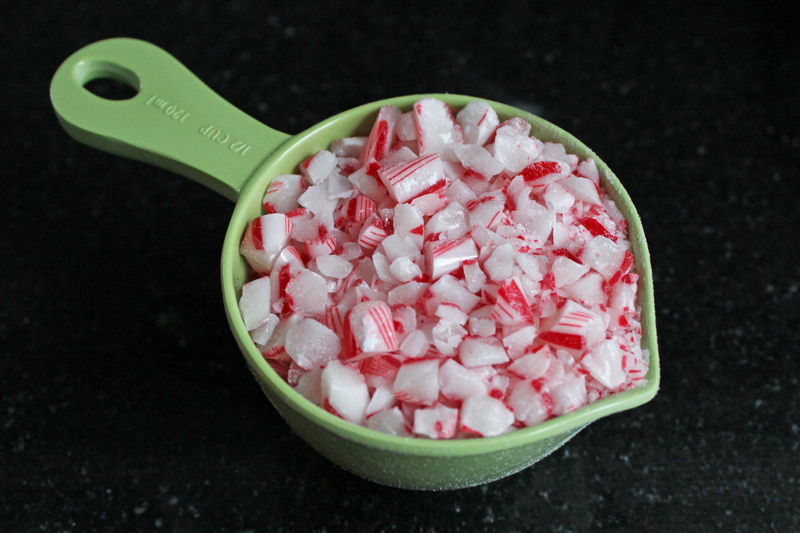 Fold in the crushed peppermint candy. Put in an airtight plastic container and place in the freezer for at least an hour, preferably several hours. If it has been frozen for more than a day, you may need to let it sit at room temperature for a few minutes to soften it before serving. Yay! You were finally able to use it! Looks delish. Peppermint is my favorite flavor, too.